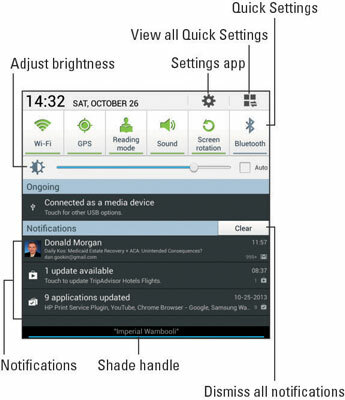 Notifications appear as icons at the top left of the Home screen of your Samsung Galaxy tab. To review them, you pull down the notifications shade by dragging your finger downward from the top-left part of the screen. The notifications shade is illustrated below. Touch a notification to deal with it. What happens next depends on the notification, but most often the app that generated the notification appears. You might also be given the opportunity to deal with whatever caused the notification, such as a calendar appointment. Dismiss an individual notification by touching it and then swiping to the right or left. To dismiss all notifications, touch the Clear button. Some ongoing notifications, such as the USB notification cannot be dismissed. When you’re done looking, you can slide the notifications shade up again: Swipe the notifications shade handle by dragging your finger up the screen. If you find this process frustrating (and it is), touch the Back button. If you don’t deal with notifications, they can stack up! Notification icons disappear after they’ve been chosen. Dismissing some notifications doesn’t prevent them from appearing again in the future. For example, notifications to update your programs continue to appear, as do calendar reminders. The text above the notification shade handle refers to the currently connected Wi-Fi network. Some apps, such as Facebook and Twitter, don’t display notifications unless you’re logged in. The tablet plays a sound, or ringtone, when a new notification floats in. You can choose which sound plays.